Back outside to paint again today. I did not have a lot of time before a commitment, so it was a small study, only 3.5 x 5 inches. 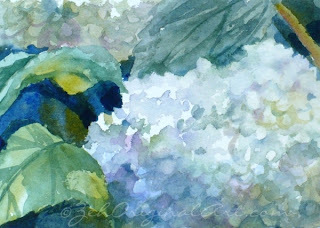 This time, I focused on the Annabelle Hydrangeas that are so prettily blooming in the front garden. They are white, but I washed some varying colors into the shadows for interest. It would be nice to do a larger painting of these pretty flowers from life. If the weather holds, perhaps tomorrow! Find my original paintings and prints at JanetZeh.Etsy.com.